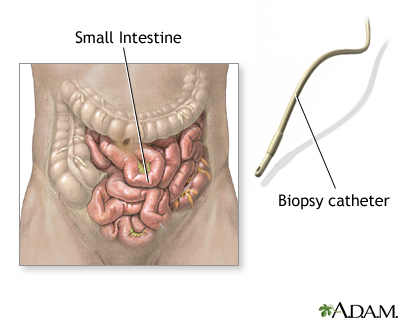 Small bowel biopsy is a diagnostic procedure in which a portion of the small bowel lining is removed for examination. A flexible fiberoptic or video tube (endoscope) is inserted through your mouth or nose and into the upper gastrointestinal tract where a tissue sample is removed. This test is most often performed to help diagnose diseases of the small intestines.